The highly anticipated debut of prospect Josh Thole could have been more difficult, but the Mets made the right move by matching him with lefthander Pat Misch. Sure, I could be completely wrong — Thole could suffer seven passed balls and six stolen bases, while striking out five times. But I believe the Mets have given him a strong opportunity to succeed by choosing this game, this opponent, and this starting pitcher. For one, it’s a day game, played outdoors and under natural light. Right there, Thole should be comfortable, as it is always much easier to see the flight of a ball in broad daylight than it is at night under artificial lighting. This is an advantage both in terms of batting and in receiving pitches behind the plate. Secondly, the Mets have matched Thole with one of their easiest pitchers to catch. Pat Misch relies on pinpoint control, using a small repertoire of pitches that generally range from 70-85 MPH. If anything, he throws too many strikes and is always around the plate. He’s thrown only one wild pitch in his MLB career, and less than a dozen in close to 800 minor league innings. In short, he is a catcher’s dream in terms of receiving the ball. Additionally, Misch is a poised, unflappable, easygoing veteran — no worries about having to calm him down in times of adversity. Contrast Misch with, say, Oliver Perez, and it’s easy to understand my point. Neither is easy, but from my own experience, catching a pitcher whom you’ve never caught before can be much harder than hitting one you’ve never faced before — and it all depends on the pitcher’s command, velocity, and repertoire. Someone like Ollie Perez, John Maine, or Bobby Parnell — who throw at high velocity and tend to be all over the place — are extremely difficult to receive because the catcher may have no idea where the ball is going, nor what route it’s going to take, and he has little time to react. Remember the struggles of Brian Schneider early last season? Those were due specifically to the unfamiliarity with the pitching staff, and secondarily to a new glove. As we’ve been told, Josh Thole has been catching many of the Mets pitchers in the bullpen since his promotion. And that’s good, but not necessarily enough — it depends on the pitcher. Some are around the plate and have pitches that run and break consistently, and you can get a “feel” for the distance they’ll move when they’re not on target. Also, it’s easier when the top velocity is lower, and there are less pitches to “learn” — for example Pedro Feliciano throws only an 87-MPH fastball and a sweeping slider, so he might be easier to catch than, say, Brian Stokes, who can hit 97 MPH with the fastball, and also has varying degrees of success with a curve, slider, changeup, and split. Francisco Rodriguez, I imagine, would also be difficult to catch, mainly because his pitches break so sharply and so late — and often into the ground and wide of the strike zone. The pitcher’s personality is another can of worms which we won’t get into in depth. But consider this: what if Thole’s MLB debut came last night, and he had to deal with Mike Pelfrey’s case of the yips? Or if he had to get Oliver Perez back on track during one of those “Ollie Innings” ? Another consideration is calling the game. I would bet that the pitches will be called from the dugout today. After all, Thole doesn’t know much about the strengths and weaknesses of MLB hitters, and isn’t yet familiar with Pat Misch’s game-time abilities. 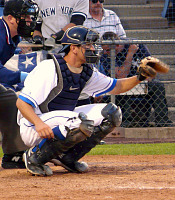 We’ll see soon enough how well Josh Thole handles himself behind the dish. We’re told his best tool is his bat, and that he needs work on his catching skills. That said, the Mets have made his MLB debut as easy as could possibly be managed. For once, a logical decision based on thought and preparation. 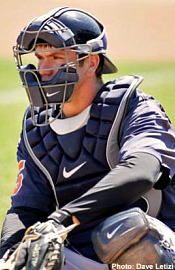 With the rosters expanding to 40 tomorrow, the Mets have announced the promotion of catcher Josh Thole from AA Binghamton. According to MetsBlog, Thole will wear uniform #30. Nick Evans is expected to get a callup as well, though it has yet to be announced. The Buffalo Bisons are not exactly brimming with talent, and still have games to play, so more players will trickle in to Flushing over the next two weeks. Do the Auditions Really Matter? The Mets’ season has been officially meaningless for several weeks now, making the last quarter of the season something of a mass tryout. Heading into September, we’re hoping to see a few more fresh, young faces, and assuming we’ll garner information that will help shape the 2010 Mets roster. A major consideration is this: what happens if some of the auditions go bad? For example, what if Bobby Parnell continues to have trouble getting past the fourth inning, remains very hittable, and still doesn’t have a reliable secondary pitch at the end of September? He still will be penciled in to the back of the 2010 rotation, won’t he? Somehow, the Mets will glean a shining moment or two from his outings, grasp onto it, and spin it as the reason he has “a bright future”. Similarly, we’ll get a whiff of Josh Thole — and if he fails, does that mean the Mets will sign Bengie Molina or make a blockbuster trade to bring in a new catcher over the winter? In contrast, what if Thole hits .400 and proves to be adequte behind the plate over, say, a 15-game span? Is that enough of a sample to mark him down as the catcher of the future? To bring back Brian Schneider at a reduced rate to be his guru? Methinks the decision has already been made, one way or the other. Dan Murphy may be the biggest question of all — and one mystery that may not be unraveled by October. Should Murphy continue the strong pace he’s held for the last few weeks through September, he’ll finish around .275-.280 with a .325 OBP and maybe 10 HRs. What will that strong finish mean to the Mets plans for first base? The starting job for Murphy next year? And if Murphy slumps in September, does the plan become to acquire a first baseman? Other than Parnell, is anyone getting a true “audition” for the pitching staff? The starting rotation currently includes Tim Redding, Pat Misch, and Nelson Figueroa. Are any of those three really being considered for next year? Figgy is coming off an outstanding start, but he’ll likely have to repeat that performance four or five times to get a legit shot at next year’s rotation. Yet, if Parnell pulls off a similar outing, many will point to it as a reason to mark him down as the #4 starter in 2010. My point is this: during these “auditions”, people will see only what they want to see — the opinions are predetermined, and people will look for evidence to support that determination. If someone believes today that Bobby Parnell should be starting next season, it won’t matter if his ERA continues to balloon over the next four weeks — they’ll hang on to the fact that his slider has improved. If Figueroa spins three more starts like yesterday’s, they’ll be dismissed by those who view him as a journeyman at the end of his career. Should Dan Murphy slump in September, his supporters will accentuate his hot streaks and point out his advancement in the field; conversely, if he hits .350 over the final weeks, his detractors will harp on his lack of homerun power. But that doesn’t apply only to fans — it’s also pervasive in the front office and the coaching staff. We know this because it’s the way they’ve operated over the past several years. Ironically, you need look no further than Murphy for the most recent evidence. As you may remember he was written in as the starting left fielder on the first day of spring training — it didn’t matter that Jeremy Reed flashed a better glove and was the team’s leading hitter. The handling of Mike Pelfrey at the beginning of his career was similar; the Mets made the decision that Pelf was ready for MLB and kept sending him to the mound regardless of how overmatched he looked (sound familiar?). The Mets’ expectations regarding players coming off injury is perhaps most telling. For example, the 2008 bullpen was built around the assumption that Duaner Sanchez would be the setup man –and stayed with that plan even after he failed to break a pane of glass in spring training. Similarly, they assembled the 2009 starting rotation with the idea that John Maine was 100%. Again, even after Maine struggled mightily all spring, he was expected to be the #2 or #3 starter. They had not seen his lack of command and hittability — they saw whatever it was they wanted to see (velocity? spin on the curve? ), that would justify their preconceptions. We can pretend that the final month is a “tryout” of sorts, but really, it’s four weeks to gather and collect information that supports preconceived notions. Along the way, someone for whom you have reserved no judgment may surprise you. Yankees Block Carter – So What? Yesterday I thought we’d reached a low point when the DFA of a career minor leaguer caused excitement in the Mets blogosphere. Today, I’m seeing we fans sink even lower in this steep abyss of failure and mediocrity we’re calling the 2009 season — because now, we’re mad at the Yankees for preventing the Mets from auditioning another career minor leaguer. Don’t get me wrong — I was excited as the next guy at the possibility of seeing some new (and healthy) blood come into Flushing, and wow us with his homerun hitting skills. But now, various sources are reporting that Chris Carter will be staying in Boston, because the Yankees claimed him on waivers as a handcuffing strategy (it forced the Red Sox to pull Carter back and keep him on their 40-man roster). Disappointing, yes, the news will hardly ruin my September. First of all, the Yankees could care less about who the Mets want to audition in meaningless September games, and that consideration likely never entered their minds. The Yankees, after all, are focused on “meaningful games in September” (as Fred Wilpon so aptly describes them). And I can’t blame them — why should the Yankees do the Mets any favors, particularly in the heat of a pennant race? Did the Mets do the Yankees a favor by giving Billy Wagner to the Red Sox? And in return for peanuts, no less? Along with the potentiality of the Bosox getting two extra picks in next year’s June draft? Hmm … LHP who throws mid-90s and has closing experience … draft picks … in return for two non-prospects … yeah, we should be ticked at Brian Cashman for screwing up the Mets’ September, since Omar Minaya was so kind in helping out the Yankees! Second, the blame is misplaced if it’s on the big bad Yankees. You want to blame someone for screwing up Chris Carter’s audition? How about blaming the Red Sox, who should have pushed Carter through waivers a month ago. It’s standard routine to send all your players through waivers after the trading deadline — no doubt the Bosox passed through people like Mike Lowell, Rocco Baldelli, Takashi Saito, etc. — so why not Carter? Third, consider the silver lining. The fact that Carter won’t be in New York means there will be opportunities for others. For example, maybe without Carter around, the Mets will consider claiming Matt Murton to try out in left field. Perhaps not having Carter’s means Josh Thole will get some reps at first base. Or it could mean someone like Lucas Duda or Ike Davis gets a surprise promotion. At the very least, it should mean more at-bats for Angel Pagan and Cory Sullivan, and more first base experience for Dan Murphy. Seeing those three players for another 25-30 games will be helpful in determining where (or whether) they fit into the plans for 2010. But hey, if you want to project your anger toward the Bronx, that’s your prerogative — and if it helps you cope with this sorry excuse for an organization, then go ahead and let it all out. Personally, I’d rather be “mad” at the Yankees for something more worthwhile. Luis hit a line drive into the outfield to drive in two runs. I swear, it went beyond the infield dirt, in the air. No kidding. Knight is one of those regular joes you have to root for, but unfortunately his stuff is pretty ordinary. He’ll be nice to have waiting in AAA for depth, but let’s hope he isn’t needed for an extended period of time. Murphy continues to take pitches and “hit ’em where they ain’t”, slapping the ball to the opposite field. Church took out O’s shortstop Jolbert Cabrera on a double play in the 3rd. Colbert didn’t like it, and let Church know it, but the bum was standing on second base so not sure what the fuss was about. It was great to see a Mets player purposely make physical contact with an opponent, then tell the guy to kiss off afterward. Haven’t seen much of that since the Bobby V days. Remains unimpressive. However, he has inspired me to begin throwing with my left hand. He looks like Daniel Murphy’s prodigy with that open stance and patient approach. Duaner’s fastball is still floating in the 83-85-MPH range. If he’s still around there come April, I can see him getting released, then re-signed, as no one else is likely to take a chance on him. His desperation has led to throwing a rinky-dink slider. Sad times for Sanchez. Though, I wonder if his velocity can be regained with a mechanical tweak … it looks to me like his hips are opening before his arm whips around — in other words, his arm is a little “slow” to catch up to his hip explosion. Either he needs to increase his arm speed, or he needs to find a way to retard the opening of his hips, possibly by lengthening his stride. Nice to see Johnny teaching the changeup and sans his guido mustache. He still sounds like a guido, but what can you expect from a kid from Brooklyn? The Japanese import has pretty good stuff. He won’t dominate in the AL East, but he shouldn’t embarrass himself. And for the record, his name is not pronounced “ooey-hara”, as the Mets announcers referred to him; it’s “ooh-way-ha-rah”. Continues to smoke the ball. He mashed a line-drive double in a pinch-hitting role against George Sherrill in the fourth. Fossum continues to throw at all kinds of speeds from 64 MPH to 91 MPH, yet gets hit like the batters know what’s coming. Hmmm ….. maybe that’s the problem? Nick FINALLY turned on one and jerked it way over the left field fence. Yes, it’s nice he can go to the opposite field, but it’ll be even nicer if he can mash the ball over the wall like that more often. This had to be the display of power we’d heard about but hadn’t seen at the big league level. Yes, Rivera also hit a bomb. I’d still rather have Pudge Rodriguez.